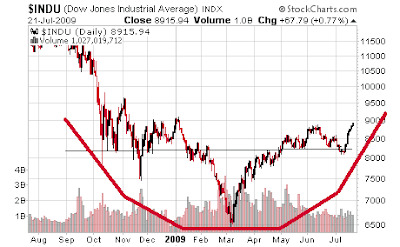 I pulled out a longer term chart of the Dow and there is what looks like a potential rounding bottom formation and failed signal on this last breakdown. Both of these are bullish. The fundamentals are hard for me to get a hold of here on a lot of stocks and the economy. I'd say stock prices are more likely to be overvalued fundamentally. I also strongly believe we will be in a range-bound market for many years. I'd be very surprised if we saw new highs on the indices anytime this year or next year. I'd actually be scared because I fear what the next crisis will be like. I think the economy and stocks should have cooled off and consolidated with the savings and loan crisis at the least. All of that totally conflicts with the current market forces that are driving stock prices higher. I don't think market forces are always intelligent but using technicals can give me a better read on the short and mid-term direction. I don't have much experience with the indices technically so I'm treading pretty lightly here. One type of bottom formation is a rounding bottom. It looks very similar to the long term chart on the S&P and Dow. Confirmation would be about 10,000 on the Dow. I like this next one the most right here. 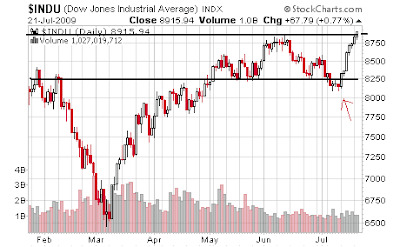 We were stuck in that range from May until just recently when it looked like the market was going to breakdown. The arrow points to that move. We actually did make a new low there below the chop. Then those sellers and skeptics got wiped out as the market forced them higher and prevented a breakdown. That was the failed signal. What that means is the strength here is very strong. If it can't go lower we can only go higher technically. This is beginning to be confirmed as new highs are being made out of this range signaling more upside potential. If we hold these highs or retest and run there could be much more upside in this rally. Really though, a no brainer time to go bullish and get long was when the failed breakout pushed above the trend support line. I didn't even think about the failed signal because I was expecting more lows and didn't flip the picture around which this chart says to do.